GREAT SOUTHERN EXPOSURE LOOKING FOR RENTERS WITH PRICES STARTING AS LOW AS $80 PER NIGHT. * IT’S COASTAL LIVING AT ITS BEST!! SLEEPS 4. DISCOUNTS FOR FIRST RESPONDERS, TEACHERS, AND POLICE. ** NEW AUGUST 2017!!! HI SPEED INTERNET AND A LAND LINE INSTALLED WITH FREE LONG DISTANCE IN US, CANADA, PUERTO RICO AND MEXICO. THERE ARE ALSO CHARGING STATIONS FOR YOUR DEVICES. 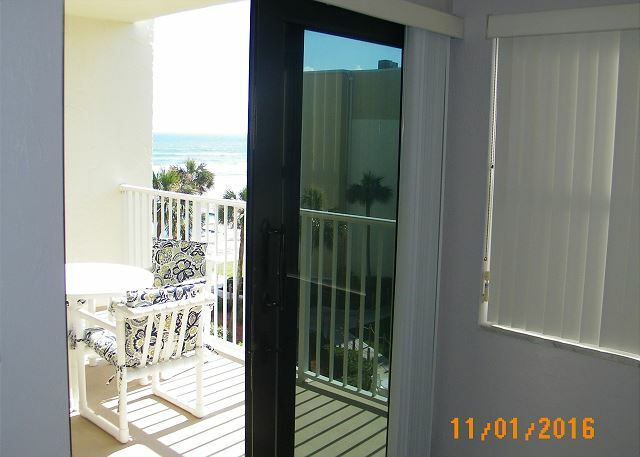 ENJOY THIS FRESHLY PAINTED ONE-BEDROOM CONDO FOR YOUR BEACH STAY WITH ALL NEW FURNITURE AS OF 2016. WAKE UP TO THE BEAUTIFUL VIEW OF THE OCEAN AND POOL WITH THE BEST VIEW IN THE COMPLEX. MAKE A CUP OF COFFEE IN THE KEURIG WITH YOUR COMPLIMENTARY COFFEE AND SIT OUTSIDE ON THE SOUTH FACING BALCONY WHILE LISTENING TO THE OCEAN AND VIEWING THE BEAUTIFUL WELL-KEPT GROUNDS. YOU WILL BE STAYING ON THE NO DRIVE BEACH CONVENIENTLY LOCATED ACROSS THE STREET FROM SHOPS AND RESTAURANTS. OR DON’T LEAVE THE BEACH TO EAT BECAUSE YOU CAN WALK TO A POPULAR RESTAURANT LOCATED ON THE BEACH JUST A SHORT WALK NORTH. THERE IS ALSO A NEW PULL OUT QUEEN BED IN THE LIVIING ROOM. THE MAIN BEDROOM HAS A KING BED. THE BRIGHT KITCHEN IS FULLY STOCKED AND INCLUDES A TOASTER, MICROWAVE, AND TOASTER OVEN. THE REFRIGERATOR IS LARGE AND INCLUDES AN ICE MAKER. THE STOVE WAS NEW IN MAY 2017 WITH A GLASS TOP AND IS SELF CLEANING. THERE IS ALSO A LARGE PANTRY STOCKED WITH PAPER ITEMS. THERE ARE TWO SLIDERS IN THE UNIT FOR GREAT VIEWS. ONE IN THE LIVING AREA AND THE OTHER IN THE BEDROOM. YOU CAN SIT ON THE COUCH IN THE LIVING ROOM AND STILL SEE AND HEAR THE OCEAN. THE HEATED POOL IS LARGE WITH A DEEP END AND HAS A KIDDIE POOL. TABLES ARE LOCATED AROUND THE POOL OR SIT UNDER THE PAVILION IN THE SHADE WHILE FRIENDS PLAY SHUFFLEBOARD. THE COMPLEX ALSO HAS A TENNIS COURT AND ON THE BEACH SIDE THERE ARE GAS AND CHARCOAL GRILLS FOR YOUR USE. NEAR THE GRILLS THERE IS A CLUBHOUSE WITH A SMALL KITCHENETTE AND TABLES OUTSIDE OR IN TO EAT. YOU WILL HAVE A LARGE 45 INCH FLAT SCREEN TV TO WATCH IN THE LIVING ROOM OR REST IN THE BEDROOM AND WATCH TV THERE ON ANOTHER FLAT SCREEN. THE LIVING ROOM HAS A BLUE RAY DVD PLAYER FOR THOSE STAY AT HOME EVENINGS. DURING THE WINTER THERE ARE PLANNED ACTIVITIES BY THE RESIDENTS TO KEEP YOU BUSY INCLUDING GOLF AT SEVERAL LOCAL COURSES. IF YOU WISH TO ATTEND A CATHOLIC CHURCH THERE IS ONE WITHIN WALKING DISTANCE. THERE ARE FOUR CEILING FANS TO MAKE YOU COMFORTABLE. EVERYTHING YOU WILL NEED FOR A GREAT BEACH STAY ARE INCLUDED SUCH AS UMBRELLAS, CHAIRS, ICE CHEST AND BEACH TOWELS. THE CONDO HAS FRESHLY CLEANED TILE FLOORS AND WOOD LAMINATE IN THE BEDROOM. THERE IS ALSO A SPACIOUS DRESSING AREA AND LARGE CLOSET. THERE ARE TWO SINKS. ONE IN THE DRESSING AREA AND ONE IN THE POWDER ROOM. IF YOUR CAR GETS DIRTY OR SALTY THERE IS A CAR WASH AREA RIGHT ON PROPERTY AND YOU WILL APPRECIATE THE LOCATION OF THE LAUNDRY ROOM AND TRASH CHUTES. THEY ARE STEPS AWAY FROM YOUR FRONT DOOR. ALL YOU NEED TO DO IS PICK YOUR DATES. REMEMBER THERE IS A 3 NIGHT MINIMUM. PLEASE NO SMOKING, AND NO PETS UNLESS YOU ARE STAYING LONGER THAN 6 MONTHS. *BASED ON A WEEKS STAY DURING THE OFF SEASON WITH A DISCOUNT. **10% DISCOUNT FOR TEACHERS, FIRST RESPONDERS AND POLICE. Great place to spend the winter! We spent January and February at #409 and were very happy with the accomodations! We were here for January and February 2019. Great unit - comfortably furnished and has a well stocked kitchen. Very roomy for a one-bedroom unit compared to others we've stayed at! We've already reserved for next year! Very nice condo. Our only complaint was the fire alarm going off multiple time including 5 am one morning. 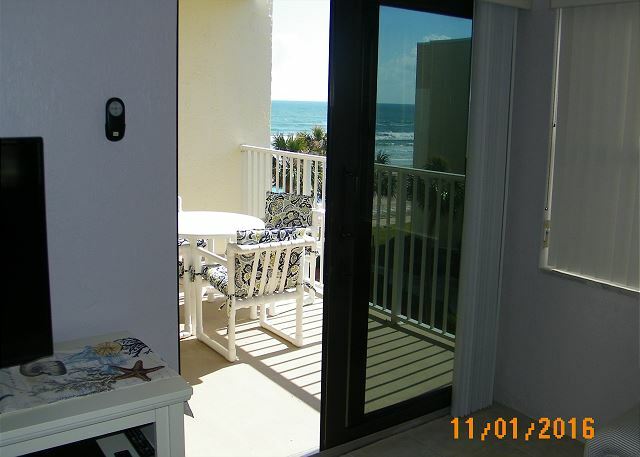 We enjoyed our stay in condo 409, sitting on the deck, listening to and watching the surf and soaking up the sun. The condo was comfortable and had everything needed for a relaxing holiday. We really aren't able to comment much about the property management company (4 star rating). Our encounters by phone, email and in person were quite brief but efficient. Overall the unit was clean, however, the 4 star reflects a suggestion that some attention, from time to time, be given to dusty areas such as under the bed, headboard/frame of bed and the fan. The condo's amenities allowed us to enjoy barbecuing and eating on the deck. Its excellent proximity to the beach meant we could walk and swim when we wanted. While in NSB, we like the quality of meat etc. and great service at Gary's Meat Market in Edgewater. Unit 409 is a wonderful unit. It has everything you need and is decorated beautifully. Extremely clean. The overall property is well maintained and inviting. I highly recommend this vacation rental. Very clean, comfortable property with a terrific view. Pristine, uncrowded beach also. 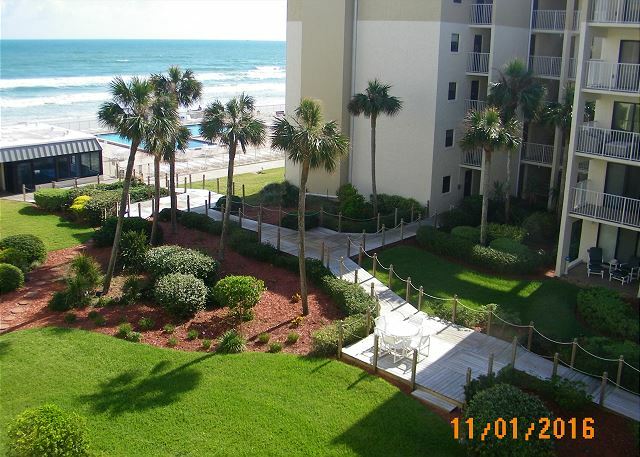 Wonderfully restful and easy beach access. Love staying in the no drive part of the beach. The condo was very accommodating and supplied, and king size bed was appreciated. I requested a hand held shower attachment which owner said she would have installed. Everything else was perfect! Everything was just as described, it was perfect! The view was amazing, the condo was comfortable, plenty of amenities and the owner was extremely easy to work with and went out of her way to assist us. We will absolutely being staying again in the future!!! Stayed for a week--enjoyed the location. Area is very quiet and family oriented. Great beach! Nice shopping center directly across the street. This was a great unit with a great view. Totally enjoyed our time at Castle Reef. Many opportunities to meet and join in activities. Only negative is WiFi it is a horror at most times. Beautiful location with amazing ocean views. The property was accurately described. Older building but maintained with great care. The grounds are gorgeous with mature plants and trees. Restaurants across the street from condo and other convenient stores. 3) The old telephone gave problems. 4) The old CRT TV was very ancient by today's standards. Despite these problems we were pleased with the location of the property and the amenities such as swim pool, shuffle board, "Movie Night". We met quite a few very pleasant fellow travellers and owners. Management and staff were very helpful.